Do you know who loves soup more than Mafalda’s brother Guille? Nick does! He is a soup boy through and through. He’s also known to never share his soup with anyone. Not a drop of his 3 plates per sitting. Not.A.Drop. Since I love him enough to put up with his soup loving tactics I try to make him soups more often than I would’ve chosen to. 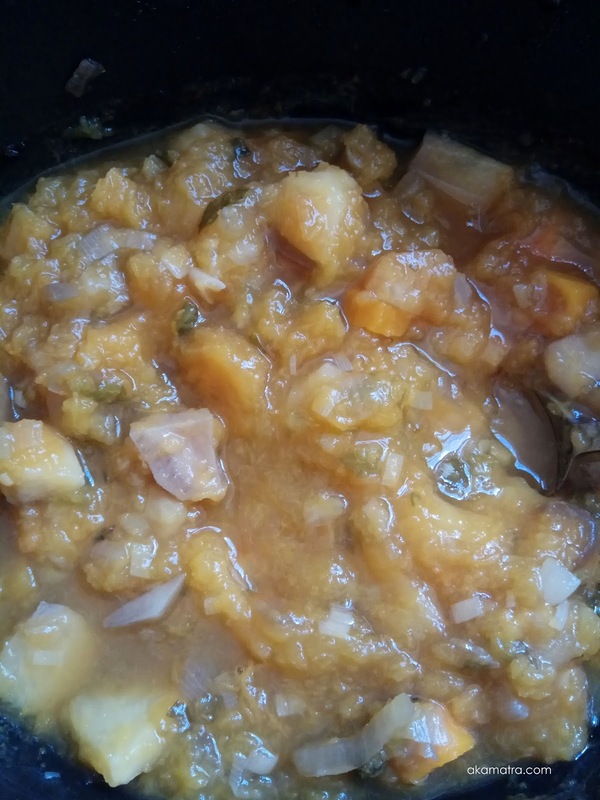 Last week I made a slow cooker pumpkin soup that was a huge success. Admittedly there is a small fuss about cutting and preparing a pumpkin but it is so worth it! I have a very simple and almost fuss free method to deal with them. I cut them in large pieces, take out the seeds (do not throw them away!!!) and put them in the oven for 1 hour at 150 Celcious. Then I skin them (it’s super easy once they are cooked) and I either use them immediately or store them in the freezer. I also put the seeds on another tray in the oven at the same time and they become super crispy and yum! Cover the veggies with water and set the cook on low for 8 hours. Once it’s done I use a hand food processor to blend everything into velvet - like soup. Add olive oil after serving. If you are not vegan this is great to pair with feta cheese or yogurt! · Instead of water you can use either vegetable or chicken broth. I like clear tastes so I use water for my soups. · All the veggies I use are organically grown and (in my opinion) their taste is fuller and there is no need for extra spices. Also, since the food I prepare is for Natalia too, I try to keep it simple. That said I think this soup would be great with some more spices like turmeric and a hint of nutmeg. Let your taste buds guide you! Do you like pumpkin soup? What’s your favorite type of soup? What’s the one food you don’t share with anyone?